© LifeArk 2019. All rights reserved. The Los Angeles County Homeless Initiative announced the winners of its first-ever Housing Innovation Challenge Friday, awarding $4.5M in total funding for innovative housing solutions addressing homelessness in LA County. The Homeless Initiative has awarded five winners after receiving over 50 proposals that were rigorously evaluated by a panel of experts. LifeArk was selected to receive $1M in funding for its pilot project to provide permanent supportive housing for homeless individuals stepped-down from Illumination Foundation’s Recuperative Care Program. Illumination Foundation will provide intensive case management services (ICMS) support including life skills classes, substance use disorder (SUD) groups, and connections to community resources essential to long-term housing and health stability. Other winners include Brooks + Scarpa Architects Inc., FlyawayHomes, LLC, Restore Neighborhoods Los Angeles (RNLA), and United Dwelling, LLC. Meet all the winners and their proposals here. View LifeArk’s full proposal here. LifeArk was featured in a 7 part series by Forbes discussing groundbreaking architectural solutions to climate change. Y-Jean Mun-Delsalle discusses LifeArk’s genesis as well as its innovation in affordable, floating architecture. Read the full article here (PDF version, ad-free). For the web article, click here. Hanley Wood announced on Monday the honorees of the 2018 HIVE 50 Awards. “HIVE continues to stimulate new ideas and shape the future of housing. This year’s HIVE 50 Honorees feature an amazing group of people, products, and processes that are transforming the conversation with forward-thinking ideas and innovative approaches.” - Peter Goldstone, CEO of Hanley Wood. 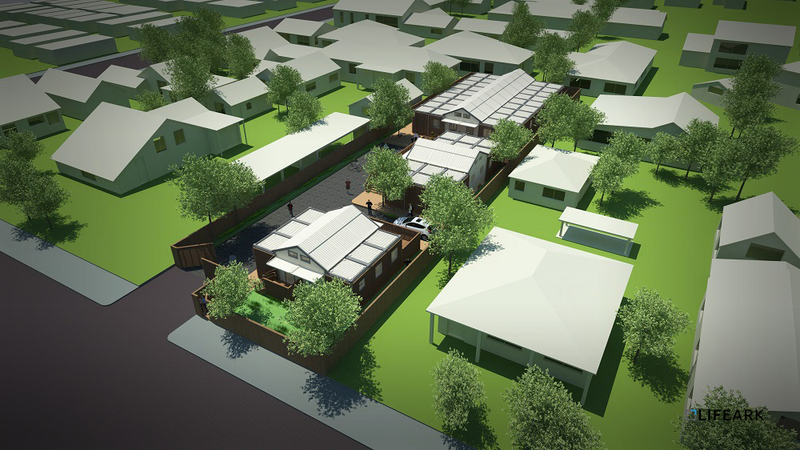 GDS Architects was selected as a HIVE 50 Innovator in the Design category for LifeArk’s “Resilient Housing” system. Focusing on LifeArk’s capabilities to create self-sustaining communities on land and water, while providing solutions to hazardous living conditions caused by climate change, natural disasters, armed conflict, and economic disparity, Hanley Wood and HIVE 50 Innovators have recognized players that are “leading the charge to inspire creativity, improve performance, and explore better ways to build”. New York, April 9, 2018 —Fast Company is today announcing the winners of its World Changing Ideas Awards, which honor businesses, policies, projects, and concepts that offer innovative solutions to the issues facing humanity. All of the finalists are highlighted in the May issue of the print magazine, which hits newsstands on April 9. Now in its second year, the World Changing Ideas Awards showcases 12 winners and more than 200 finalists. A panel of eminent judges selected winners and finalists from a pool of more than 1,300 entries in 12 categories, from Food to Energy to Developing World Technology. Honorees include big-name brands like Microsoft and Walmart, nonprofits like the Anti-Defamation League and Unicef, government programs from Los Angeles and Ontario, and innovative startups like Aerofarms, Aspiration, and Matternet. The 2018 awards featured entries from across the globe, from India to Brazil to Rwanda. Fast Company’s May issue celebrates these world changing ideas, highlighting how Los Angeles Mayor Eric Garcetti has spearheaded a solution to the city’s housing crisis by using backyards as a building place for tiny houses; Facebook, whose Disaster Maps feature helps rescuers allocate resources after disasters; L’Oreal, which has designed a tool to make sure its products are as sustainable as possible; and The North Face, which has designed a new wool beanie that is sourced from sheep farms that use agricultural practices that emit less carbon than they produce. About the World Changing Ideas Awards: World Changing Ideas is one of Fast Company’s major annual awards programs and is focused on social good, seeking to elevate finished products and brave concepts that make the world better. A panel of judges from across sectors choose winners and finalists based on feasibility and the potential for impact. With a goal of awarding ingenuity and fostering innovation, Fast Company draws attention to ideas with great potential and helps them expand their reach to inspire more people to start work on solving the problems that affect us all. LifeArk is a BFI Fuller Challenge Semifinalist! NEW YORK CITY (August 17, 2017) - The Buckminster Fuller Challenge is delighted to announce the Semifinalists for the 2017 Fuller Challenge. A record number of entries were submitted in this 10th anniversary cycle of the program. Seventeen proposals were selected as Semifinalists from more than 460 entries. The Buckminster Fuller Challenge program has been highlighting and celebrating exceptional examples of “whole systems” design across many sectors for the past 10 years. Launched in 2007, the program has been widely regarded as "socially-responsible design’s highest award" (first recognized by Metropolis Magazine in 2010). The 2017 Fuller Challenge Semifinalists are exemplars of innovative, multi-pronged approaches to addressing critical problems in agriculture, architecture, climate change, community planning, education, ecology, economic development, energy, human health, materials, sanitation, environmental and social justice, and other domains. The seventeen Semifinalists have undergone rigorous evaluation for adherence to the Fuller Challenge criteria over a period of 4 months by members of the Challenge Review Committee, which includes more than a dozen long-standing reviewers as well as external advisors and experts. While the list of Semifinalists below is categorized into problem spaces, the proposed solutions reflect integrated strategies that respond to multiple issues simultaneously as required in the Fuller Challenge Call for Proposals. "These Semifinalists were drawn from a truly exceptional pool of initiatives. We were very gratified – having been at this for ten years now – to see that the quality of the visions, the caliber of the teams, and the commitment to solving complex issues demonstrated in the entry pool were at an all-time high. It seems fitting to conclude and celebrate the first ten-year chapter of this prize program with the knowledge that comprehensive, anticipatory approaches to problem solving are on the rise around the world. On behalf of the entire Fuller Challenge team, we want to extend our congratulations to this year’s Semifinalists!" said Elizabeth Thompson, Fuller Challenge Founding Director. LifeArk presents a physical solution to vulnerable human living conditions caused by climate change, natural disasters, armed conflict, and economic disparity through a pre-fabricated, modular building system that can create self-sustaining aquatic or terrestrial communities. Today, more than 1 billion people around the world dwell in slums, while more than 65 million people have become refugees or have been forcibly displaced. The LifeArk solution is a rapidly deployable structure that is flexible enough to respond to each individual community’s needs through its various configurations. It is fitted for transportation in standard shipping containers, can be mass produced at low cost and rapidly assembled with commonly available tools, and it allows for a variety of structure types, including community centers, health clinics, schools, hydroponic farms, and dwelling units—all of which can have a lifespan of 25-30 years. The units will contain built-in amenities as well as off-grid systems for clean water, energy, and waste management. The globally-adaptable LifeArk design is about to be prototyped on a lake in Texas and then deployed in the pilot community of Santa Rosa, Peru, along the Amazon River.